Thanks for being patient with this little diversion/Halloween Special. And thanks for reading as always. 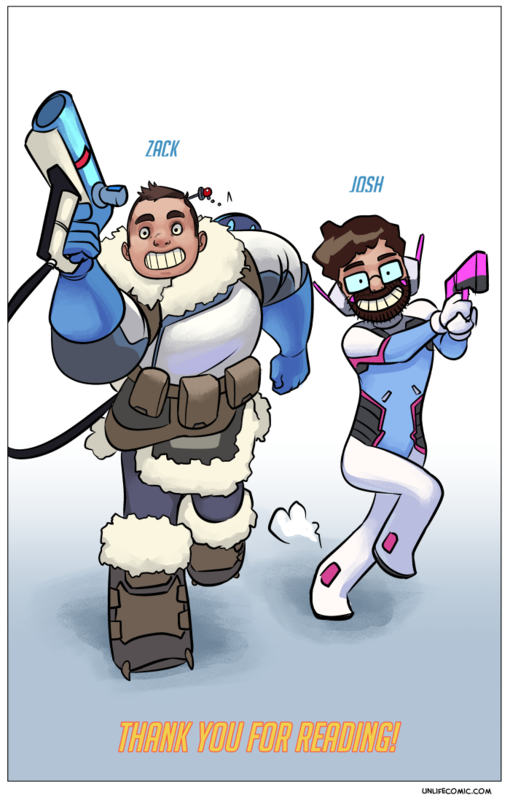 So, Josh and I adore Overwatch! Other than the colorful, unique characters I adore the solid polished gameplay which focuses on Goals and Objectives over killing the other team. You do totally shoot others, but that’s a part of the objective. And thanks to the game I find myself making new friends, and socializing outside of my usual circle. Quick play is fun, but i kind of hate hero stacking. I like competitive though. The game feels much more balanced that way. Everyone doing their jobs. And yeah. I play Mei, but I don’t at all troll my own team with icewalls. There’s something awesome about her crowd control. Be good guys! Normal Pages back on tuesday!